President Trump’s strikes on Syria over reported chemical attacks in the country included not only missiles, as previously used against the country, but also U.S. aircraft that were manned by pilots. The Pentagon confirmed Friday night that the targeted strike against Syria involved putting pilots at risk to carry out the attacks. The reports of pilots’ involvement in the Syria strikes were confirmed online by multiple news agencies. Though, it does remain unclear how many pilots were involved in the strike. The pilots, reports claim, did not enter Syrian airspace. BREAKING: Pentagon Briefing on U.S. Strikes in Syria: Manned aircraft were used in the strike. U.S. & “coalition” manned aircraft are engaged in military operations, but not within #Syria’s airspace – in addition to multiple naval vessels (inc. submarines). That’s a substantial step-up from the 2017 cruise missile strikes on Shayrat. 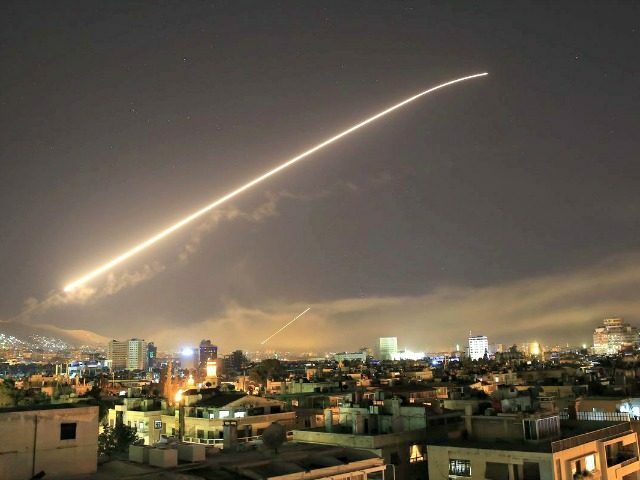 As Breitbart News reported, the strike against Syria was targeted and isolated to three targets and carried out in coalition with France and the United Kingdom.